Al Hartmann | The Salt Lake Tribune Corrections officer Lance Christensen helps Matthew Martinez pick out a pumpkin at Kauri Sue Hamilton School in Riverton Tuesday October 22. 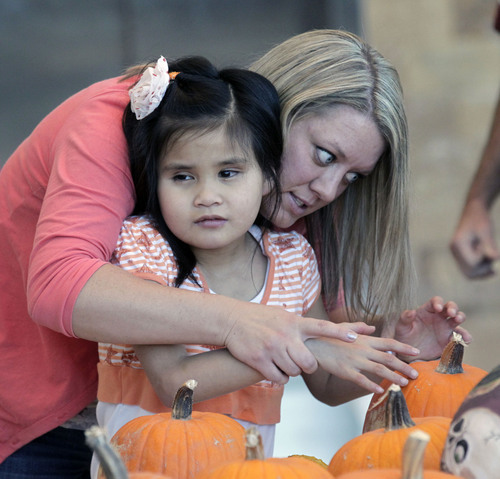 More than 3,000 pumpkins grown by Utah prison inmates were given to children. 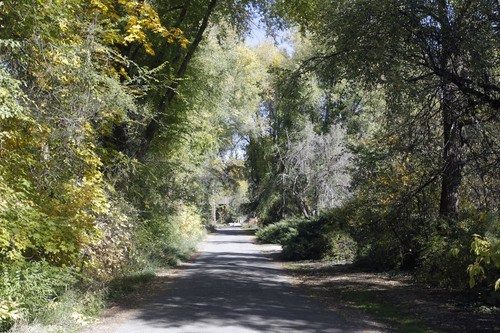 Al Hartmann | The Salt Lake Tribune Long private tree-lined driveway near Walker Lane in Holladay, where Mitt Romney plans to build a new house. Al Hartmann | The Salt Lake Tribune Hundred of pumpkins grown by Utah prison inmates were given to the children at Kauri Sue Hamilton School in Riverton Tuesday October 22. Some were intricatley painted in scary scenes. Al Hartmann | The Salt Lake Tribune Paraeducator Laurie Truckfield shows Thomas Soper a gourd among the pumpkins at Kauri Sue Hamilton School in Riverton Tuesday October 22. More than 3,000 pumpkins grown by Utah prison inmates were given to children. Al Hartmann | The Salt Lake Tribune Corrections officer Lance Christensen helps Matthew Martinez pick out a pumpkin at Kauri Sue Hamilton School in Riverton Tuesday October 22. 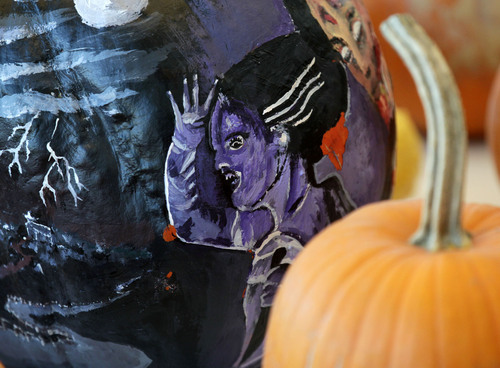 More than 3,000 pumpkins grown by Utah prison inmates were given to children. Al Hartmann | The Salt Lake Tribune Paraeducator Nikki Conk guides the hands of Elli Green who is totaly blind to feel the texture of pumpkins at Kauri Sue Hamilton School in Riverton Tuesday October 22. 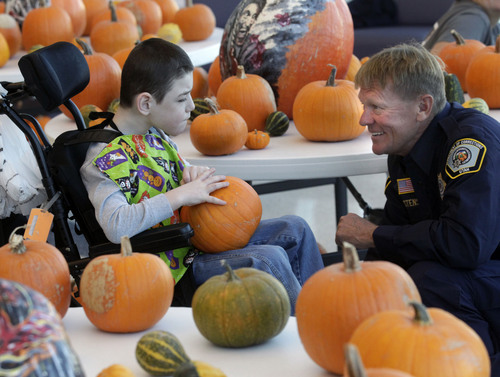 More than 3,000 pumpkins grown by Utah prison inmates were given to the children. 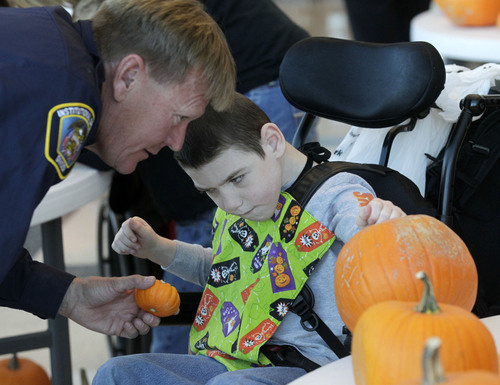 Prison pumpkin patch • Officers from the Utah State Prison delivered 225 pumpkins grown by inmates to special-needs children at the Kauri Sue Hamilton School in Riverton on Tuesday. In all, inmates participating in the prison&apos;s Greenhouse program grew more than 3,000 pumpkins which were then donated to hospitals and organizations that work with children. The pumpkins were grown from seeds donated by Mountain Valley Seeds. For inmates, the treat is the good feeling they get working in the garden and doing something nice for children. The treat for children is getting a free Halloween pumpkin. While offenders don&apos;t get to interact with or meet the recipients, many children send notes of thanks. Inmates are now at work growing poinsettias that will be distributed to children and put on display at the Capitol Building during the holiday season. Females inmates also will build gingerbread houses to donate to the Festival of Trees, an annual fund raiser for Primary Children&apos;s Hospital.